(PRESQUE ISLE, MAINE) – The Maine Potato Board has selected the Donald Fitzpatrick family of Houlton as the 2018 Farm Family of the Year. Donald planted his first crop of potatoes when he was a freshman in high school, and this spring he helped plant his 66TH potato crop. Donald learned a lot from that first six acres. That fall potatoes were $5/barrel. He waited for more money and sold his crop for maybe $1/barrel and hauled many to the starch factory for fifty cents per barrel. A school colleague had planted a similar plot. He sold his in the fall for the aforementioned $5 per barrel. School friend bought a new car…Donald bought an old pickup. Lesson learned! Family is everything to Donald. At times there have been four generations seen working the harvest. Son Toby is actively involved in the farm operation, and son Chris helps as needed on weekends and takes vacation during harvest to work full-time on the farm. Donald’s love for agriculture has been passed on to his grandchildren. Grandsons James and Riley are the newest generation of Fitzpatricks to join the farming operation. James, Chris and Lauren’s son, just graduated from Husson with an MBA and Riley, son of Toby and Renee, will be attending Northern Maine Community College in the fall. Their daughter-in-law Kathy lives in Bangor but often visits the farm. Holding it all together is Donald’s wife Dorothy, who also grew up on a farm. When asked if she had any advice for a young woman marrying a farmer, she responded, “This is what my mother told me when I asked her for guidance when I married Donald: ‘don’t start milking the cow, because you’ll always have to!’ Lucky for me, we had no cows.” Dorothy and Donald will celebrate their 60th wedding anniversary this summer. Church is also very important to Donald, and he has been a faithful member of St. Mary’s Catholic Church his entire life. Donald has always strived to be a good steward of the land, demonstrated by his willingness to try new or different conservation measures. In the early 1980s Donald began to take soil conservation seriously by implementing various practices to improve his soils and increase crop yields. He began planting a winter cover of oats, spreading hay to reduce soil erosion, establishing grassed waterways, and working toward a three-year rotation on most of his acreage. 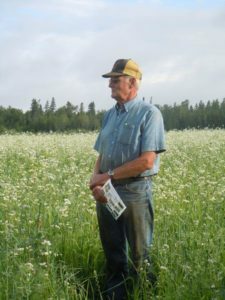 In 2003, he was the first grower in Aroostook to experiment with the “one pass hiller,” which resulted in fuel savings, less root damage and reduced soil compaction. Donald feels a responsibility to steward his land in a diligent and accountable manner. As the saying goes, “they don’t make any anymore”. Among his many “firsts” are his creating the first certified compost operation in Maine. In 2014 he received the McCain Foods Environmental Award. Donald embodies his belief that growers have a responsibility to support and advance the Maine potato industry in whatever manner they can, and he has willingly shared his experience and expertise throughout the industry. He has partnered with the University of Maine Cooperative Extension on many studies. He has dedicated some of his acreage for organic grain and potato production, certified through MOFGA. He’s incorporated irrigation into his farming operation by digging several ponds, burying miles of underground pipe and installing more efficient irrigation systems. Donald has served on the county committee with the Farm Service Agency and served on the board of directors for the Southern Aroostook Soil and Water Conservation District for more than 20 years. In 2008 he was presented with the “Lifetime Conservation Farmer” award. Twenty-five years ago, Donald’s father Anthony was recognized as “Farmer of the Year”; it seems appropriate that Donald and his family are being recognized as the 2018 Farm Family of the Year. “My family and I are honored to represent our potato industries’ many farm families. It is my pleasure to accept and to share this recognition with Dorothy and all our family,” said Donald.